Recently we were told by the mother of a young adult sent to Kuwait that as soon as they landed in Kuwait that they were given by the US Government an eight hour indoctrinaton to convince them that Islam and Christianity were the same and that the Moslems and the Christians are in essence "brothers". How utterly stupid to convince American youth that they are brothers with the Islamic terrorists they are being sent to fight against. How utterly wicked to convince the religiously dull that the Moslems and Christians are of the same faith, then instruct them to kill those same Moslems. Sounds like the US Government is filling the troops with confusion as well as trying to give them an education in religion. Sounds like the US Government is exploiting the youth of America for a war that is senseless and has no clear cut enemy. Sounds like we better know who our God is and who He isn't!!! “SAY ‘NO’ TO RECRUITERS” caught my attention the other day on a Christian newspaper. Following the bold title the writer asked, “Suppose a traveling salesman [better use ‘salesperson’ here, ‘salesman’ is not PC (Politically Correct)!—Editor.] came to your door. He said he was representing a foreign country that had a bad government. He would like your son [or daughter] to volunteer to overthrow that government and possibly get killed in the process. What would you do?” The writer of course said that he would SLAM the door in his face! Common sense (what little Americans have these days) would tell the parents not to SACRIFICE their son or daughter for the benefit of some foreigners they did not know. The WAR on TERRORISM (whatever that means today) needs warriors—American warriors. In order to get fresh recruits for this war, the military sends out its best recruiters to act as the “salesmen” like the writer described. It really is silly to think that sending American soldiers over to a foreign country helps to keep America free. Free? Get serious here. Defend the USA? Really? Who is invading our country? Who has invaded our country lately? You say, “The Arabs!—9-11!” Excuse me, didn’t the CIA/FBI know about this event months previous to the 9-11 “attack”? Sure! We might well ask whether the U.S. government agencies actually planned this event! Common sense, what Americans pitifully lack, tells us that those in high places LET IT HAPPEN, at the very least!! “For what reason, General Jim?” Think! Well, back to the recruiters—they are out there in numbers. What amazes me is that in my 36 years in God’s service, parents would rather have their kids “join up” with the world’s military than have them “Join the Army that sheds no blood!” If they are going to die, my dear parents, why not let them die for Christ, not for advancement of the international corporations, for God’s sake! Do you think dying as a mercenary is honorable? Think! We live in 2007, remember, not back in the pre-WWII era of time. It saddens me to see young men and women go off fighting for politicians in Washington who use patriotism as a RACKET. Even WWII was a sham, for the persons in high places knew ahead of time about the pending attack at Pearl Harbor. This is an open fact now, truth hidden back then. And since that time, Americans have died for both small and large nations all around the world . . . all in the name, not of Christ, but of BIG CORPORATE INTERESTS. I wish I could say this differently, but truth is truth. Can the U.S.’s young people ultimately say “NO!” to recruiters? Very few, probably, when the pressure is on, for America is very good at propaganda—BRAINWASHING, it’s called. The writer stated that if some multinational corporation wants to EXPLOIT the resources of a foreign country, let it hire its own mercenaries. Did you know that some mercenaries get paid $100,000 a year while the military dupes get hardly anything? I’ve always questioned foreign policies ever since Vietnam. I know the world will think and act like the world, but if you are a Christian you ought to reconsider whose army you’ll join. Why not fight to free souls from the terrible slavery of sin? This is the Christian’s true warfare—the only one! Dying for politicians, perverts, even religious preachers is just STUPID! In my day, we had no choice as you do today. You either “joined up” or you got drafted, or just fled the country. At least the draft is not in motion . . . yet. You parents and patriots ought to make the distinction between supporting the (victimized) troops (that are already in war) and supporting the crafty politicians who continually LIE to those troops and put them in harm’s way for the sake of big $$ and other unconstitutional purposes. You should pray that those troops could serve God instead of man, and fight God’s wars instead of man’s. But, you see, Americans are extremely weak these days—too much TV viewing, whereby their brains are so incessantly BOMBARDED with slick propaganda and lies, it is awful hard for them to distinguish between misinformation, disinformation and the plain truth. My dad always told me that politicians are “as crooked as a barrel of snakes!” How true, dad, how very, very true. I have found out the hard way. Young and older soldiers get severely wounded, maimed for life, many never getting the help they need after the military is THOUGH WITH THEM, while others DIE for LIARS in D.C. . . . all in the name of national patriotism. Not only is war HELL, it is a Hell of a racket. You don’t have to tell me about the Islamic thing. I’ve been fighting against it for years now—not with carnal weapons, but with the Word of God. There are thousands of us out there waging this holy war. We prefer to take “captives”, not murder them, and in doing so, being born again, they become “good” Christians. Souls are precious to our Creator. If the U.S. would back our training corps as it does its military killing-machine, we would see less bloodshed overall, and a better world by far. If more recruits would enlist in God’s Army, bodies and souls could be preserved. Don’t be fooled, my dear American mom and dad, the recruiters (specifically, people in “high places”) want your kids to do their dirty work. It is so stupid to keep 65,000 troops in Germany, 40,000 in Japan, 36,000 in Korea, and thousands scattered all around this sin-sick world, as America has done, when she has not been at war with these countries for years now. The cold war is over too. It is all BULL to entice the young people into a conflict that does not belong to them. The Bible tells us clearly in Proverbs 26:17, “He that passeth by, and meddleth with strife belonging not to him, is like one that taketh a dog by the ears.” Not only has the U.S. meddled in other’s strife, this country intentionally PROVOKES strife so it has an excuse to meddle! . . . then it calls in the young troops. Will Americans ever learn truth? We claim to be “Christian”, yet we act like devils. This is not to say that other countries are altogether right and we are altogether wrong. But too often, I said TOO OFTEN the U.S. uses the “War on Drugs”, the “War on Terrorism”, etc., as an excuse to expand the U.S. government’s powers . . . then comes the perpetual expenditures of both lots of $$ and young lives. No wonder the world despises the USA, for America uses any excuse to EXPAND her sinful empire. Now, the question I’m asking here is this: “Are you young folks going to fight for something carnal or something spiritual? Will you join the army that sheds too much innocent blood or ‘Join the Army that sheds no blood?’” A true Christian army fights for God’s Biblical principles—“For though we walk in the flesh, we do NOT war after the flesh: for the weapons of our warfare are NOT carnal, but mighty thru God to the pulling down of strongholds” (II Cor. 10:3-4). If you do not understand this, please write for our free recruiting materials. Don’t let these nicely dressed worldly recruiters tell you that America is fighting for God and country. It’s ALL BULL! America is fighting for carnal profit, PERIOD!—profit for the very few, not even for the whole. If you are going to put your life on the line, do it for eternal reasons in God’s Army. If you must die, do it for Jesus Christ the Lord under His banner. Friends, Jesus never advocated carnal warfare for His followers. Read the Bible. Read about the early Christians. This does not make you a coward or less patriotic or un-American, it makes you wise indeed. There is plenty of adventure in serving Christ on the front lines of battle. I’ve been in almost 50 countries, some in wartime, some in peacetime. We’ve lost soldiers in battle, not because they were engaged in carnal warfare, but because they were Christians fighting the good fight of faith. Now, what will you do? 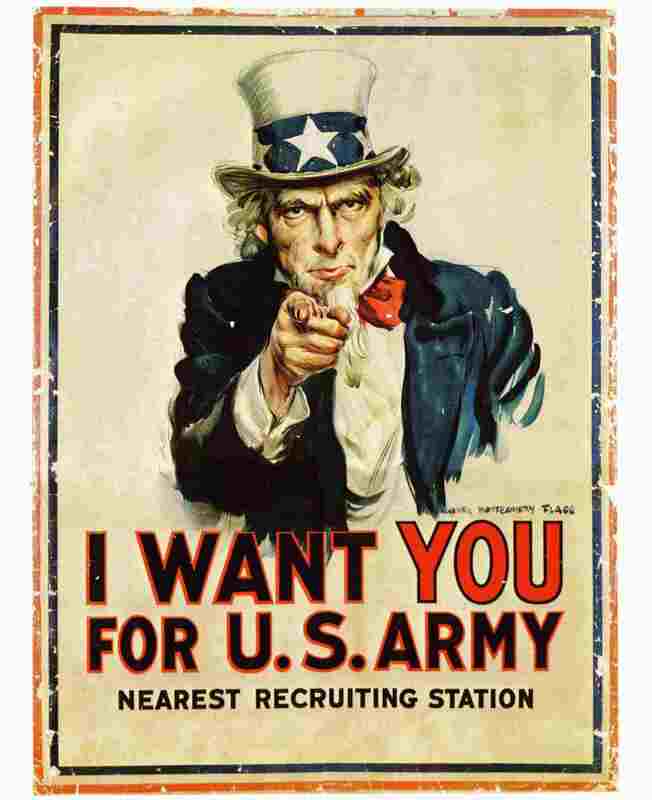 The following picture shows a real original U.S. Army recruitment poster--"I Want You", from 1918. Remember, God wants YOU for His universal ARMY THAT SHEDS NO BLOOD! Join the ranks of His Army, His Holy Tribal Nation...TODAY!